316 pages | 17 B/W Illus. Populist Discourse brings together experts from both linguistics and political science to analyse the language of populist leaders and the media's representation of populism in different temporal, geographical and ideological contexts, including Nazi Germany, Sweden, the Netherlands, Spain, Italy, Portugal, Austria, Greece, the UK, the US and South America. With 17 contributions split into four sections, Populist Discourse covers a variety of approaches such as corpus-based discourse analysis, critical discourse analysis and political perspectives, making it a timely dissection for students and researchers working in linguistics, political science and communication. "This is a timely and significant collection that probes the most disturbing and dangerous political phenomenon of our civilisation. 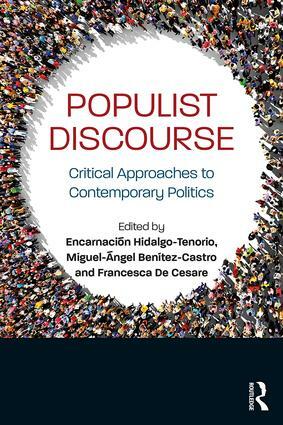 Anyone concerned about the resurgence of populism and nationalism will benefit from the insights of the contributors to this volume. Understanding what is going on is but a first step, but a crucial one." Encarnación Hidalgo-Tenorio works as a full professor in English linguistics at the University of Granada, Spain. Miguel-Ángel Benítez-Castro is a lecturer in English Language and TEFL at the Faculty of Social Sciences and Humanities of the University of Zaragoza, Spain. Francesca De Cesare is an associate professor in Spanish Language and Translation Studies at the University of Naples 'L'Orientale', Italy.